"Take Our Children to the Park... and Leave Them There Day" (Saturday, May 19) has a provocative name for a reason: to call attention to itself. Had Free Range Kids founder Lenore Skenazy, who originally came up with the idea, named it, "Give Your Children A Chance To Gather Outside With Other Neighborhood Children and Engage in Unstructured, Unsupervised Play for an Hour or Two," I'm not sure that so many people would be taking notice. Parental paranoia has risen dramatically over the last two decades. It's a trend driven by fear--fear of crime, fear of injury, and even fear of children growing up to be failures. Some parents, like Lenore, have decided that enough is enough. The world has dangers, yes, but it is not the inherently evil, threatening place that we often make it out to be. As Lenore and others point out, rates of violent crime are lower today than they were in 1974, according to the Bureau of Justice Statistics, and have been steadily declining since the 1990s. Parents fret about child abductors while carting their children around in cars, even though kids are nearly 12 times more likely to die in a car wreck than they are to get kidnapped by a stranger. And yet, people accuse Lenore of being "out of her tree." All that she is asking, really, is that parents use their common sense. She is not issuing a decree that ALL parents MUST take their children to the park this Saturday and leave them there... or else! This day is really all about empowering, not endangering, children. Lenore is hoping that by making a big deal over leaving kids to play together at a park, it will, over time, cease to be a big deal. "Clearly we are in the middle of a vicious cycle--there are no kids outside so I won't let MY kids outside, so there are no kids outside, so you don't let YOUR kids outside, so I don't let MY kids outside, etc., etc., etc--which is why the holiday (or whatever it is) is even necessary. It is a day to break the cycle. 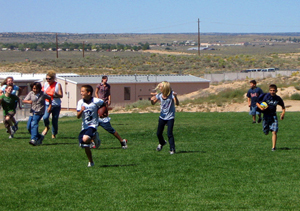 A day to get kids outside to meet each other and re-learn the lost art of playing!" Will you be taking your kids to the park... and leaving them there? A longer version of this piece originally appeared on The Huffington Post.